Frey is keenly interested in the phenomenon of architectural reuse for what it can tell us about the processes of construction as well as the attitudes of builders, architects, and patrons toward the works of an earlier time. Thus, he is part of a growing field of inquiry, known as “spolia studies,” that has its point of origin in the writings of Renaissance antiquarians. Just as in the case of refurbished buildings and monuments today, the recycling of columns, sculpture, and other recognizable parts for use in new structures is thought to have held significant aesthetic and symbolic meaning in antiquity. In particular, Frey’s work draws attention reuse practices in non-traditional settings, such as fortification walls, as a counterpoint to the far more common studies of spolia in early Christian period. For more than 20 years, Frey has worked nearly every summer at The Ohio State University Excavations at Isthmia, where he now serves as Field Coordinator under the direction of Dr. Timothy Gregory. In antiquity, this site was the home to athletic games that were as important as the more commonly known Olympics. It also was the location of an important Byzantine fortification, which was constructed in large part from the recycled parts of the Greek and Roman sanctuary. Frey’s current fieldwork is focused on publishing the large volume of archaeological documentation that has been generated at the site over the past half-century. As he demonstrates in a recently published article, the “re-excavation” of an archaeological project’s archives can be just as exciting and informative as conducting an excavation in the field. Such efforts keep the promise of previous generations to share their discoveries with those who provided them the opportunity to explore the material past. While archaeologists have always been eager to adopt new tools to aid in their investigation of the past, the greater accessibility and affordability of digital technology in particular has brought about significant changes in the ways that they study and share their discoveries. Thus Frey is involved in a number of digital projects in collaboration with museums, excavations, and study centers. The ability to create digital models of ancient places and artifacts from collections of still images is an area of particular interest, so in collaboration with MSU’s Broad Art Museum, Frey has initiated a program to create and share openly digital models of artifacts in the museum’s permanent collection. 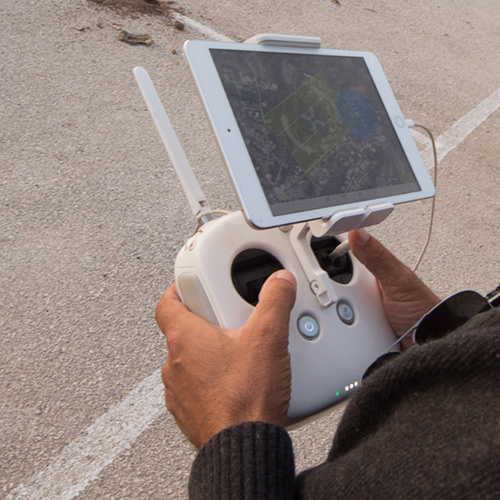 He also is helping to lead a project that utilizes aerial drone images, in combination with scanned versions of traditional maps, to build an interactive plan of the site of Isthmia in Greece. Perhaps most significantly, Frey is co-director of an NEH-funded project to build an open source software solution, designed to enable archaeological projects to study and share in an online forum the records of previous seasons’ investigations. His Archaeological Resource Cataloging System (ARCS) holds great potential to aid in the publication of archaeological research that would otherwise remain hidden in on-site archives and repositories. These files are the preliminary result of the October 2016 drone survey of the archaeological site of Isthmia and the surrounding landscape. 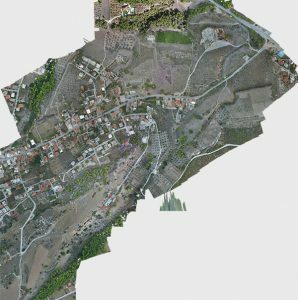 They include orthophotographs, digital elevation models and the associated ArcView world files, all of which have been created from the three dimensional model of the site generated in Agisoft Photoscan Pro. Files were created by Jon M. Frey and James Herbst (ASCSA) and are made available under a Creative Commons (CC BY 4.0) license.